Palo Alto, CA (Mar. 4, 2014) – Coco Libre, an emerging leader and innovator in certified organic coconut water, will re-present its newest line – Coco Libre Protein – at this Spring’s Expo West, March 7-9, 2014, at booth # 5689. Starting with Fair Trade certified organic coconut water, Coco Libre combines, rBst-free and grass fed milk protein isolate, to create the optimum protein blend, and uses ingredients including Dutch cocoa and Madagascar vanilla. Each 11oz. container has : 20g protein = three eggs, calcium = 2 cups of milk, potassium = 1 banana, magnesium = 2 cups of broccoli. It has no added sugar, low fat, delivers 23 vitamins & minerals, and five electrolytes (K, Ca, Mg, P, Na). 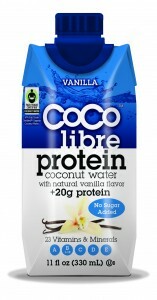 Coco Libre Protein is the NO ADDED SUGAR PROTEIN with only 140 calories per bottle. The line will also debut new packaging, an 11oz tetra pak with resealable lid. All three flavors are available in the 11oz tetra pak, have no added sugar, contain only 140 calories per bottle, and are made with Fair Trade certified organic coconut water and natural ingredients. Each bottle has as much protein as three eggs, as much calcium as two cups of milk, more potassium than a banana, as much magnesium as two cups of broccoli, 23 vitamins & minerals, and five electrolytes. They are also low in fat, cholesterol, lactose, and gluten-free. Available in three mouthwatering flavors: Chocolate, Vanilla, & Almond. Why drink anything else? Founded in 2010 by Mark Shaw, Coco Libre was the first certified organic bottled coconut water and is sourced from young green coconuts grown without pesticides. Coco Libre is available in 2 flavors, original and pineapple, is certified vegan and gluten-free, and was just recently Fair Trade certified. Both flavors are available in 11oz and in 1 Liter Tetra Paks. Both Coco Libre lines are available at fine retailers across the US and Canada.